Hair Tutorial | How to Create Beachy Waves | hi Sugarplum! I published my How-To Hair Tutorial almost three years ago to the date, and it still remains one of my most popular. It’s also one of my most-asked questions on social media, which baffles me since most of the time my hair is a hot-mess…like literally, I’m almost always in need of a hair brush. 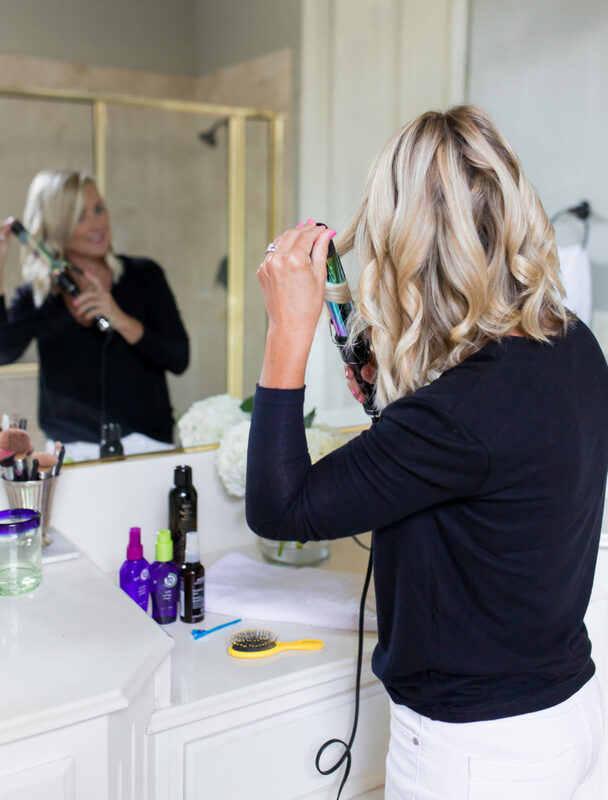 But my hair is a little longer now, and I discovered some new products, so I thought I’d share an updated tutorial on how I create loose, beachy waves. I’m also back to using a traditional curling iron (as opposed to a wand), so it may be helpful to see this method. As for my haircut, I have a long angled bob (I believe kids these days refer to it as a lob), with long layers throughout. I have a wicked cowlick, so I’m forever a side-swooped bang girl. 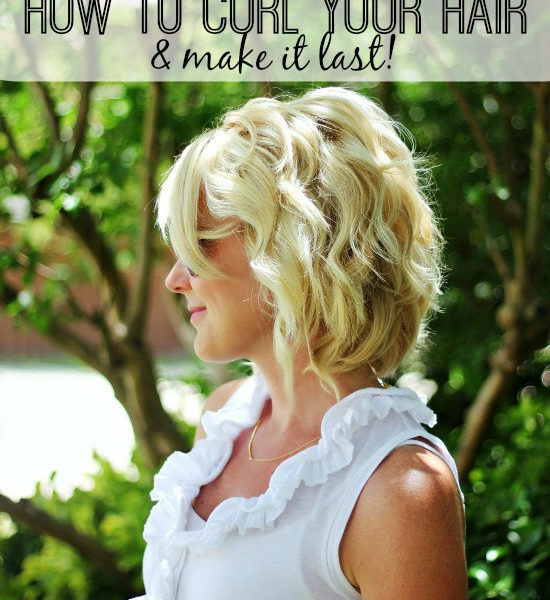 My hair is shoulder-length, but this method works the same with longer or shorter hair. 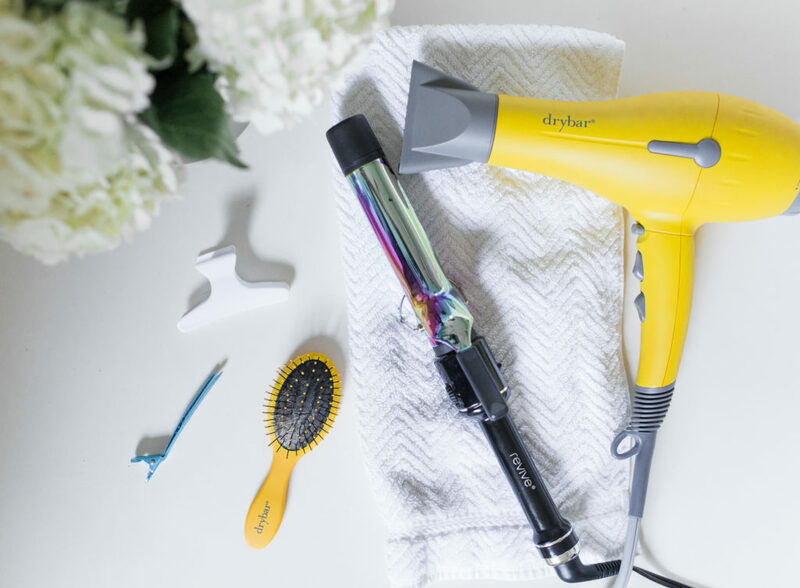 Hair Dryer // Dries your hair in half the time, while smoothing the cuticle. It’s quiet, too! Okay, now that your hair is prepped and dry, clip the top half up so you can curl by sections. 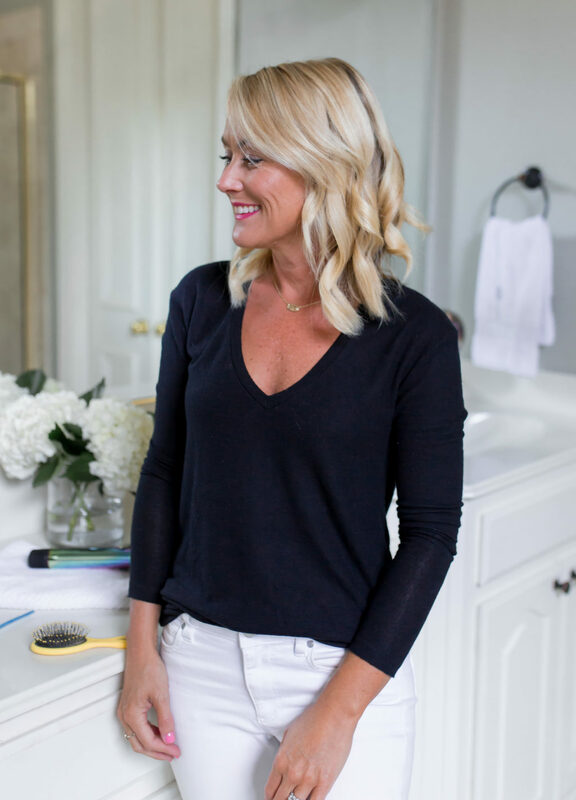 Start with a 1-inch section and quickly run the iron over the hair to smooth any rough spots and seal the ends. Position the iron a few inches from the roots, and wrap the hair around the barrel, away from the face. I keep the clamp open while wrapping so the main source of heat stays closer to the roots, as opposed to the ends. Keep the barrel vertical to the head, and don’t curl the bottom inch or so. My hair is short, so it only wraps around the barrel twice. Once the bottom layer is done, release the clip and repeat with the top layers. I alternate the direction of the curl a few times for a more natural and less-uniform look. 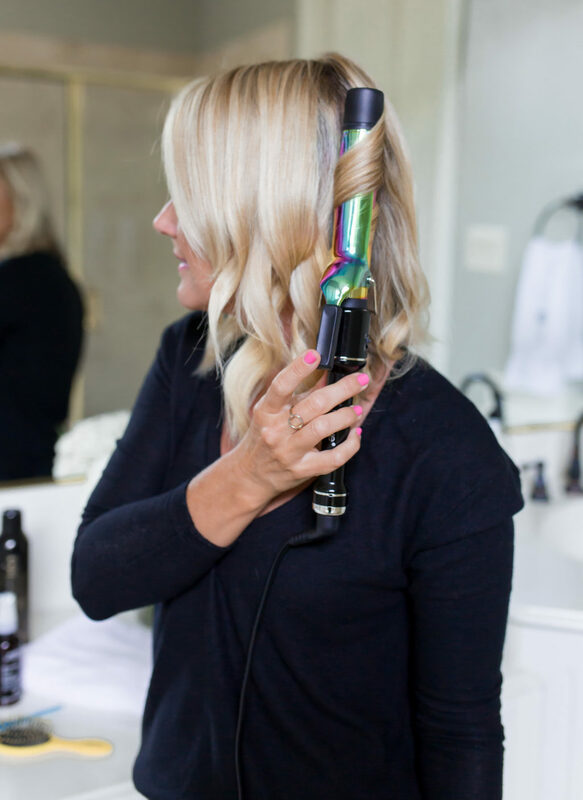 Continue curling 1-inch sections around your entire head without touching or disrupting them. 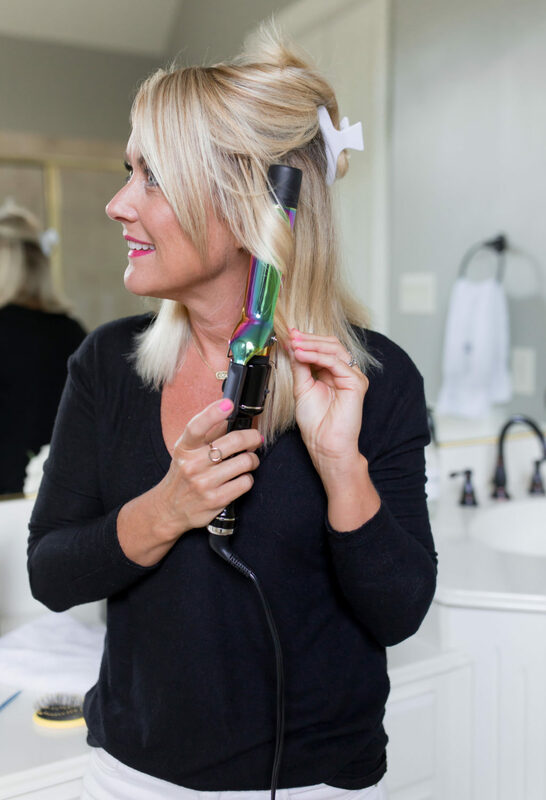 Lightly mist hair with your favorite hair spray (I love Air Control for a light, touchable hold, or Kenra #25 for heavy-duty hold). Leave curls untouched for a few minutes to cool and set. This step is what helps them to last. I usually curl my hair first, then let it set while I put on my makeup and get dressed. Once cool, gently run your fingers through your hair from underneath to break up the curls, and scrunch it to muss up the curl pattern and make them look less polished. 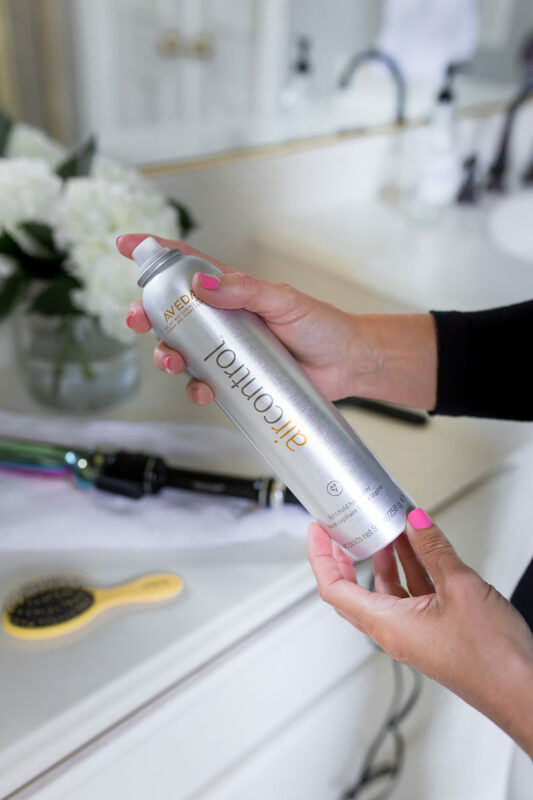 Grab your texturizing spray (this one smells like heaven), and holding the can at least 12-inches from your head, blast the roots of the crown. Make your way around your head, lifting and spraying underneath in sections. Warm a little styling serum in your hands, and finger-comb your hair back in to place, concentrating on the bottom half of your hair. Use leftover product to smooth the ends for a piecey effect. 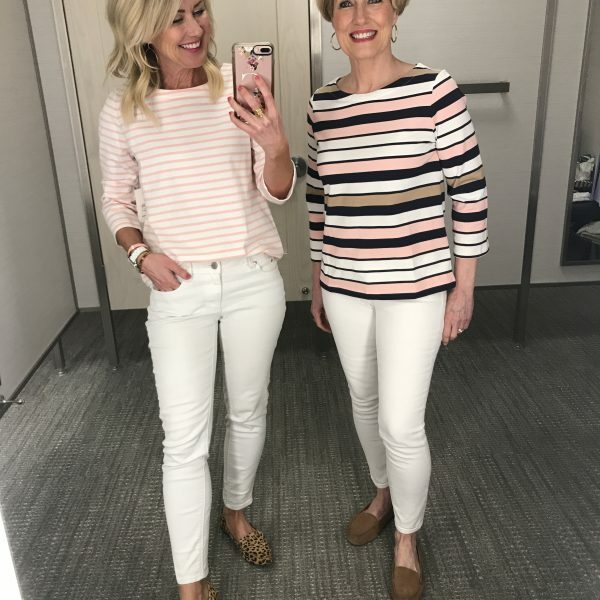 Hit it with another light mist of hairspray if you want…and you’re done!! Sometimes I use a smaller barrel for tighter curls, or comb them out while still warm for loose waves. Other times I tease my whole head with a wide-tooth comb for more volume and less curl. My hair has a mind of its own and looks different literally every time I curl it. But I just go with it…trying to force it only leaves you frustrated. 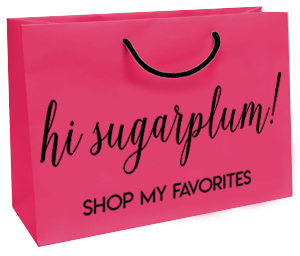 Beauty products also make great gifts, so I rounded up a few fun ideas for the beauty junkies on your list. I hear amazing things about the Moroccan Oil and curling iron, and just added the pillow case to my own list! I hope this tutorial and gift guide has been helpful! Feel free to leave any hair questions in the comments, and let me know if you have other beauty-related tutorial requests! Psst, see more Beauty posts here. Thanks Cassie! This demo is most helpful. Dying to try the “It’s a 10” products. All I know is w/color treated hair-moisture, moisture, moisture=weekly masks, etc. 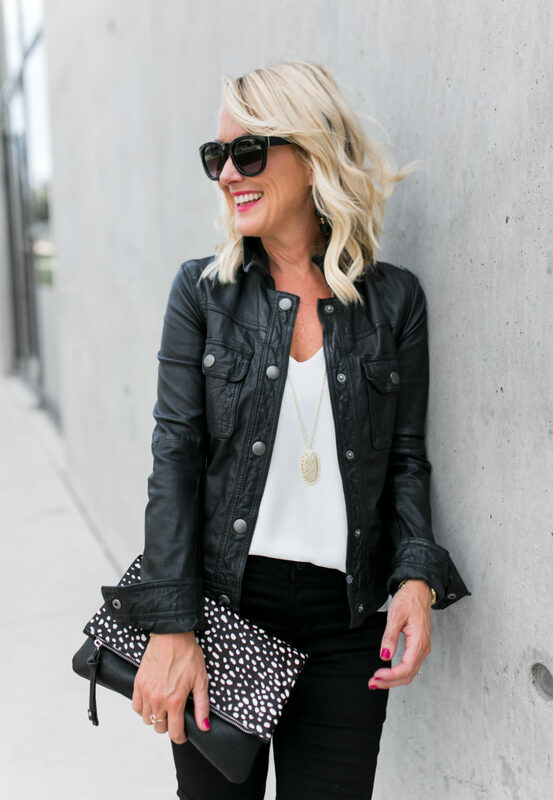 Gorgeous, glossy, color and style on you! LOL — that spray really helps…without it, my hair gets really straw-like! Seems so simple to follow. Thanks I’m gonna try this for parties this month! I mean, I might just have to try the beachy waves! Your hair always looks FAB! I just started using that product and love it!! Smells amazing, too! 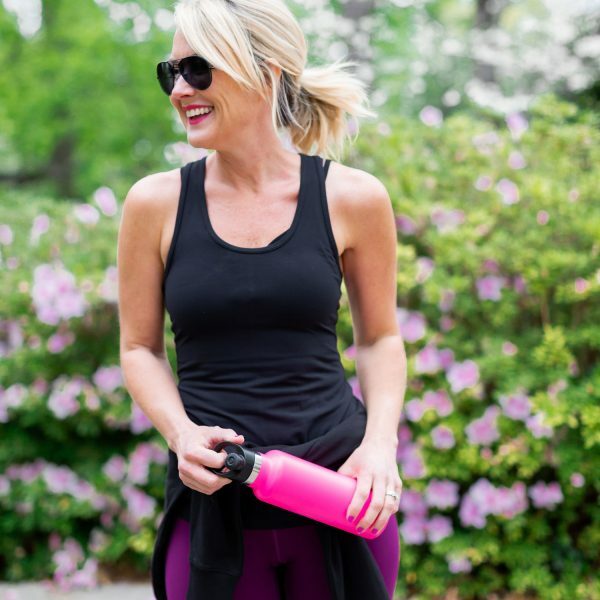 Love your hair and your blog! I love your color too, how do you do it? Thank you for the tips, I need to try the “Its a 10” spray. You mentioned once before that you had some extensions on the sides of your hair. 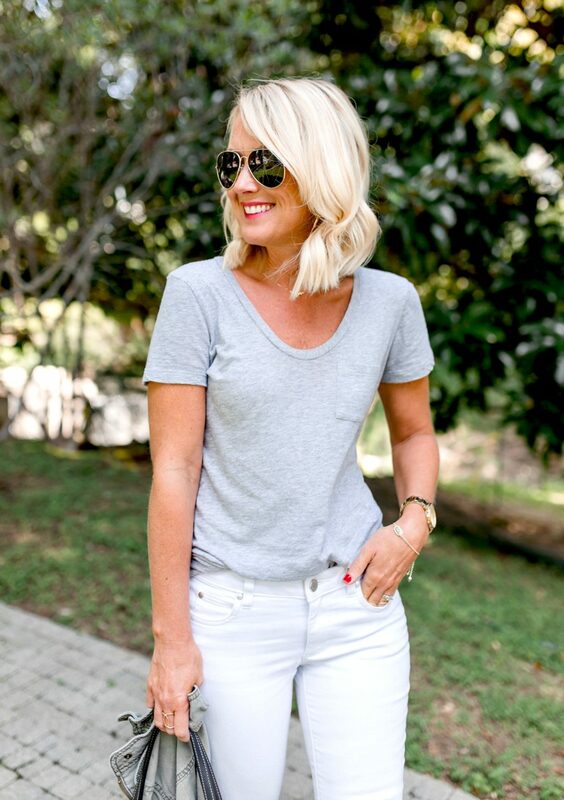 Do you recommend them for growing out those shorter areas? You just couldn’t be more precious! Cassie – I have a few extensions like you – do you have any problems with the products loosening the extensions? Thank you! I don’t…but I concentrate the product on the bottom half of my hair! Your hair always looks so great! 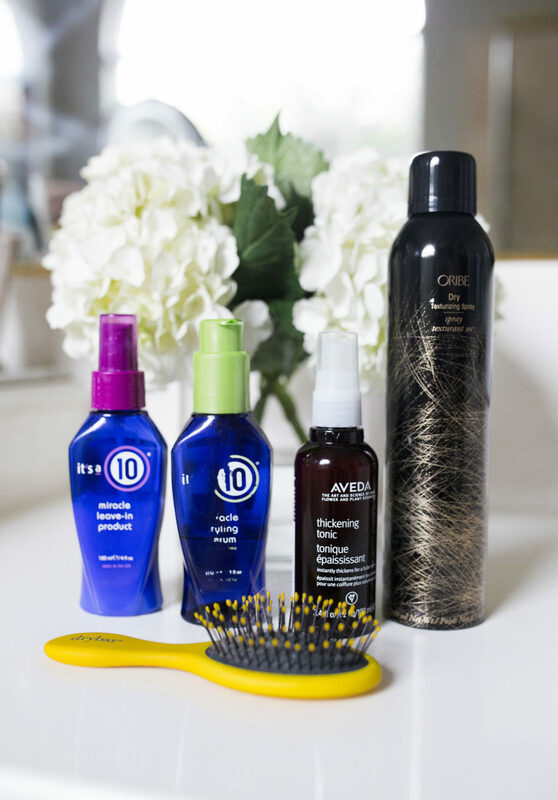 Thanks for sharing the products- I’m always on the hunt for a great thickening spray for more volume! Thanks Britney!!! 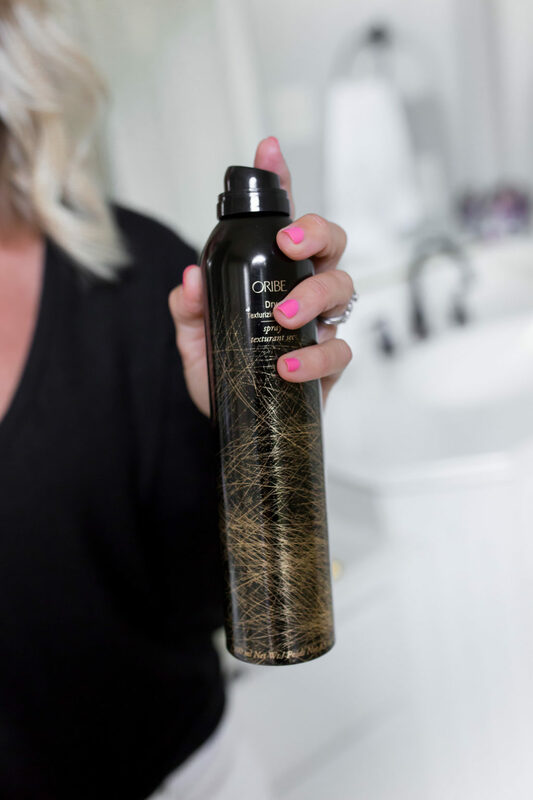 You’ll love the Oribe…adds so much thickness and texture! Great info!! You had your salon info on one of your instastories a few weeks back. But I don’t remember the name of your color specialist. Would you mind sharing again? I just moved to the Dallas area and need to find someone soon!! Thanks so much!! Your hair looks great like this. I have been trying to get mine to do this for a while, but without any product. I may just have to try you way. Thanks so much, Stacey!! I’m thrilled you liked it! I have longer, not too long, think hair and have tried a million times to get the beachy wave look and for the life of me I cannot get the curls to hold more than a nano-second. Anyone have some great ideas to get this thick hair to hold a curl? 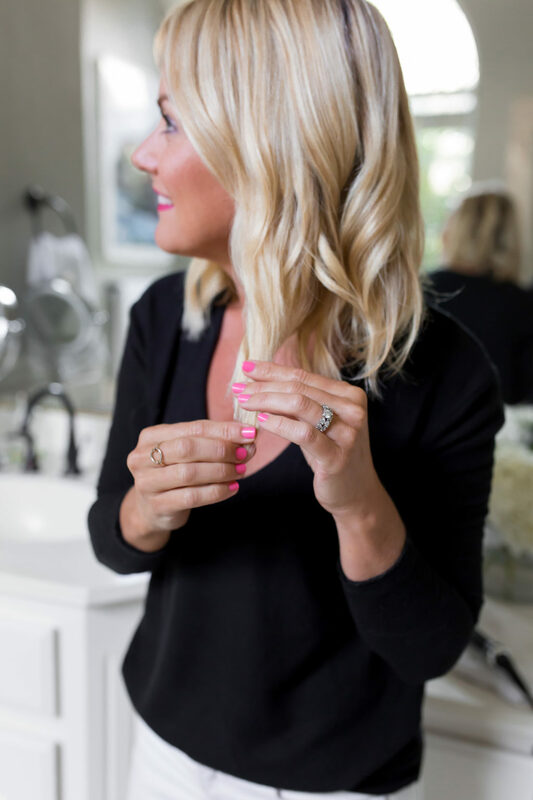 I’d curl smaller sections…and start by misting the hair with hairspray before curling it, and again after. Then let it cool completely before touching it! As I was walking through the mall some guy from a kiosk with a flat iron begged to curl my hair. I told him to give it his best shot because it wouldn’t last for more than a minute. He basically did what we learned to do with ribbon and a pair of scissors when we were young… except he used the flat iron and a section of my hair. It worked! And it lasted the rest of the day. He put a small section of my hair inside the flat iron a few inches from the scalp, gave it a twist and pulled up and away from my head while holding the hair closest to my head so it wouldn’t be yanked out! I haven’t tried it myself yet but I’m telling you … if I hadn’t seen it with my own eyes I wouldn’t have believed it. How fun!! I’m going to try that! I always love your hair! Any tips for curling the back sections? I can get the front/sides to look nice but struggle with the back looking all wonky!! My hair is about the same length as yours and I feel it’s hard to the the right angle for a good curl. Any tips for curling the back sections? I can get the front/sides to look nice but struggle with the back looking all wonky!! My hair is about the same length as yours and I feel it’s hard to get the right angle for a good curl. I just try to hold the barrel vertical to my head as much as possible…that helps! 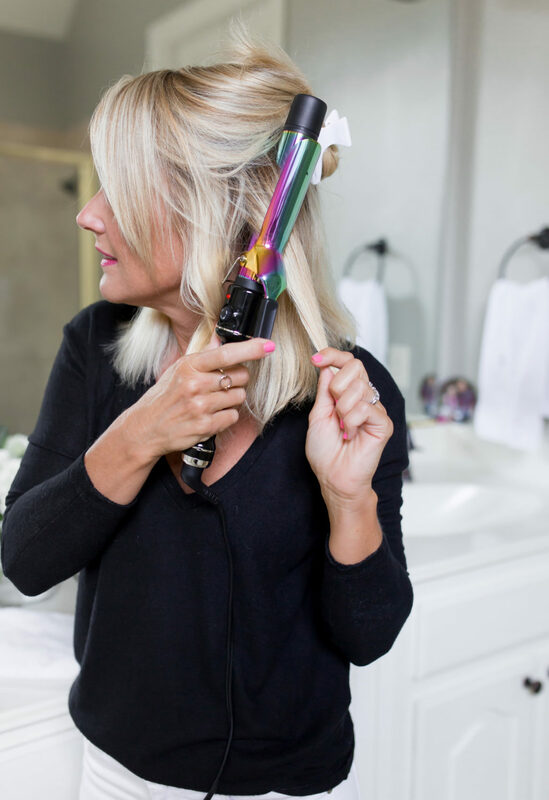 Do you keep the clamp of the barrel open the whole time while wrapping your hair around? I wasn’t clear on this step. Thanks! No, I just tap it open so the hair twirls around the barrel, instead of rolling the barrel down my hair. So hard to describe!! But I keep the main source of heat near the root instead of the ends. 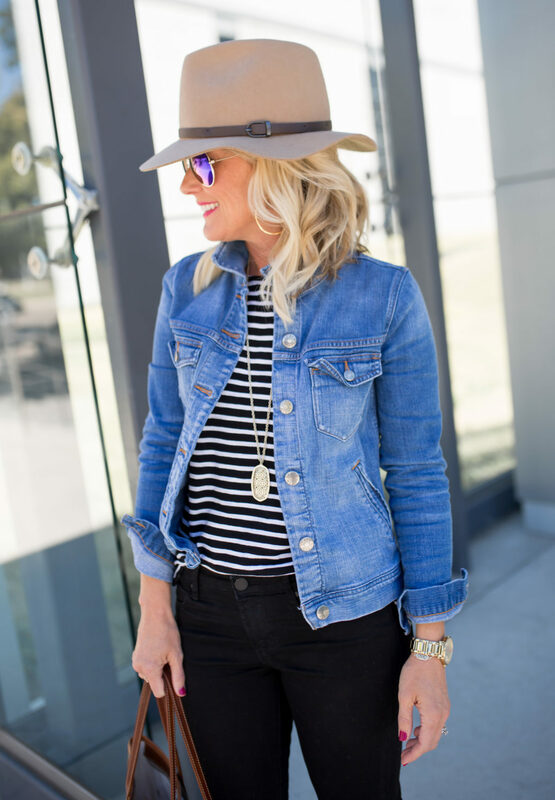 Found your blog recently and love it! Thanks for the tutorial! I have very similar hair and style that I wore fairly straight (many cowlicks) until recently. Have been experimenting, but decided to try my curling iron rather than my wand based on your tutorial. So far it looks great, and I’m excited to have improved style for DH’s holiday party tonight (also taking style tips from you and wearing velvet tank with leather jacket and black jeans). Many thanks and happy holidays! Love your hair ! Really want my side bangs like yours and no one can cut them that way 🙁 are they just angled short and blown straight with the paddle brush ? I always round brush mine and don’t like the look – please help ! Thanks !